Certainly this is not the sharpest image ever, but this spider’s net covered by droplets, looked so beautiful with the dew formation…. I will come back with a macro lens another day. 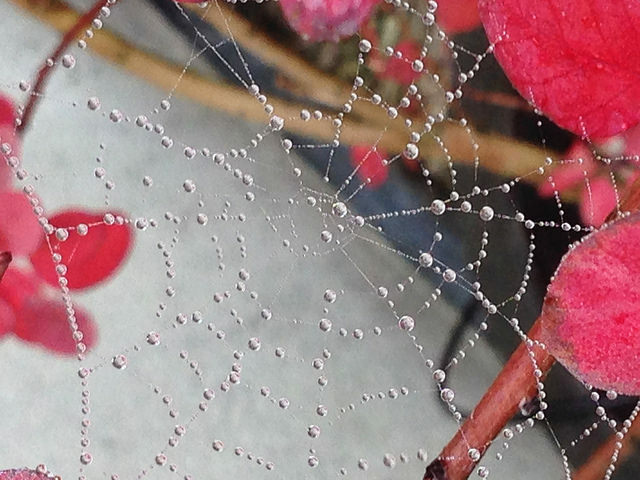 What a statement about nature’s magical artistry: those droplets look like small pearls ready to be worn. Happy Photo Challenge. The real image was fantastic Sally, really looking like diamonds. Pity that there was so much wind and I could not keep my hand steady. I’m glad to hear your views. Nature is always showing its perfection and it’s us who always fail it, either with images or deeds, isn’t it? You know I love shots like this one, Lucile. Beautiful. Yes I do! Thank you, Janet! Ilove the colour combination here. The spider web is like a fashion accessory in a photo in a high end magazine. Very clever indeed. You’re very generous, Suzanne. Thanks much for your kindness. Amazing shot Lucile! I love the droplets. Nicely captured. Thank you Debbie! I wish I had a better camera and/or there was no wind! Thank you so much, Drake. You’re very kind. It’s beautiful! And the pink color is a very pretty backdrop. Thank you, Lois! It’s a pretty plant and the spider agrees with us. Thank you Stephanie, and I’m glad you liked it, despite the lack of sharpness. Don’t show it to your husband as he still needs to go to that shop! Great photo without the macro lens. What beautiful artistry nature provided here, and you captured it well. Thank you, Angeline. Nature really gave it all despite the gear I used. Beautiful. I adore drops on webs. Like tiny jewels. I thought of your macro jewels! No comparison! Oh yes, they are beautiful. The red and creaminess behind them make for such a lovely shot. I can see why! It’s so vibrant.